Heroes tend to be portrayed as lone wolves, and families rarely interest Hollywood unless they’re psychotic, but here’s a list of men who made the protagonists what they are, and the complicated bonds that gave them the self-confidence to individuate. Joss Whedon defined Mal in Firefly as being a terrific (surrogate) father for Simon and River in contrast to their actual father, because he wasn’t just there and terrific when it was convenient for him, he was sometimes great, sometimes inept, but always there. 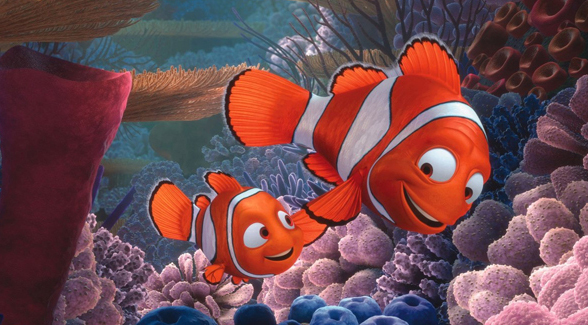 There’s too much written about surrogate fathers in the movies (read any article on Tarantino’s work) so I thought I’d mark Fathers’ Day with a top 10 list of films featuring great biological dads and great complicated but loving father-son bonds. (Inception) The moment when Cillian Murphy opens the safe and tearfully discovers his father held on to Cillian’s childhood kite as his most treasured possession is an enormously powerful emotional sucker-punch of post-mortem father-son reconciliation. (The Day After Tomorrow) Dennis Quaid excels as a father who was always around but half-distracted by work, who makes good by braving death in a quest to rescue his son from a snowpocalyptic demise. (Twilight Saga) Bella Swan’s taciturn relationship with her small-town dad, who she only ever holidayed with and who embarrasses her, slowly blossoms as he steps up to the parenting plate with some hilariously comedic unease. Before he got trapped in a zero-sum world of directing commercial tosh John Singleton’s coruscating 1991 debut portrayed the chaos of gang-infested ghetto life in a world almost entirely lacking positive male role models. His script privileges the bluntly honest wisdom of Laurence Fishburne to such an extent that he basically becomes the ideal father for a generation of black men that Bill Cosby acidly noted was raised by women, for the exact same reason that Singleton has Fishburne deliver: it’s easy to father a child, it’s harder to be a father to that child. Gregory Peck’s Lincolnesque lawyer Atticus Finch was held up as the perfect father in Vanilla Sky, but I’d strenuously favour his father in this whimsical 1946 movie that at times feels it’s an original screenplay by Mark Twain. Peck plays the type of father who’ll let you run free, and make mistakes so that you can learn from your mistakes, but will always be there to swoop in and save the day when you get in over your head. This may be an idyllic portrait of the rural South but the father’s parenting style is universally recognisable. Vito grooms Sonny to succeed him and consigns Fredo to Vegas, but he loads all his hopes of respectability onto his favourite son, Michael. Eventually, in a touching scene in the vineyard, he accepts that the one son he tried to steer away from the family business is the only son truly capable of taking it on, and that he has to let Michael live his own life and become Don. The tragedy of Part II is that Michael makes his father’s dreams of assimilation his own, but his attempts to achieve them only destroy his family. Liam Neeson has been divorced by the grating and shallow Famke Janssen who has remarried for a privileged lifestyle, which she continually rubs Neeson’s face in. His relationship with his daughter, whose birthday he was always around for even if the CIA disapproved, has suffered from this disparity in wealth. But when she’s kidnapped hell hath no fury like an enraged father rescuing his little girl. Neeson’s absolute single-mindedness in rescuing his only child makes this an awesome action movie that uses extreme violence to prove the superiority of blue-collar values and earnest protective parenting over whimsical indulgence. 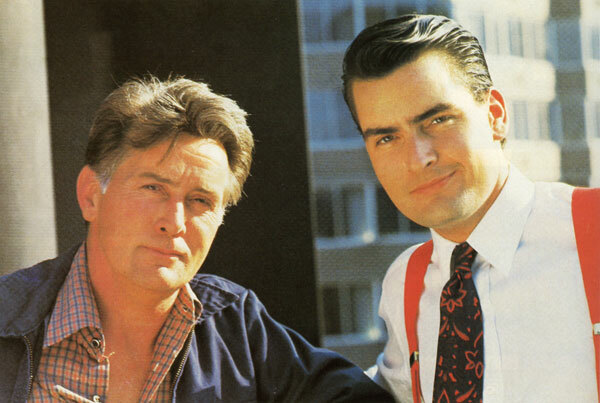 “Boy, if that’s how you really feel, then I must have done a crappy job as a father.” Martin Sheen’s words to Charlie Sheen show just how far under the spell of Michael Douglas’ daemonic father figure Charlie has fallen at that point in the movie. Oliver Stone followed Platoon’s opposition between two surrogate fathers with a clash between the humble blue-collar integrity of Charlie’s actual father Martin and the unscrupulous white-collar extravagances of his mentor Douglas. In the end Martin manages to make jail-time sound like an exercise in redemption because he will never desert Charlie. 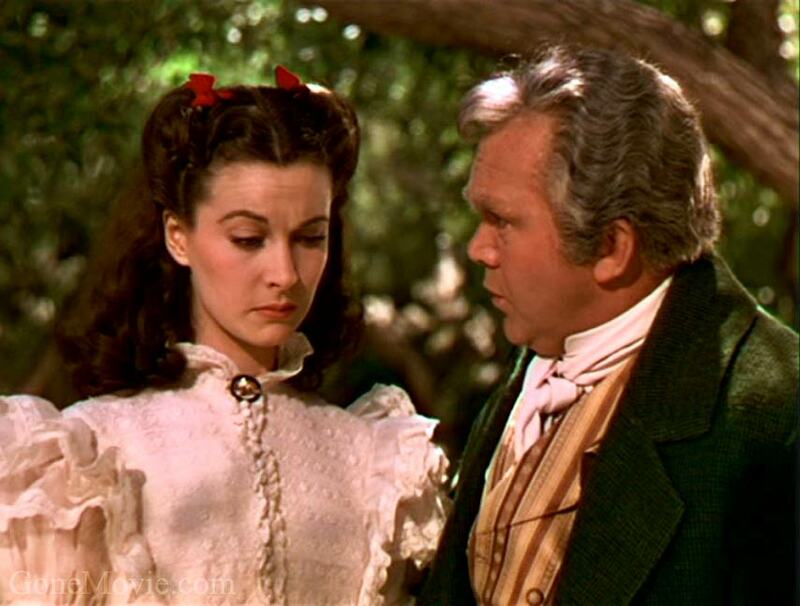 Scarlett O’Hara, the ultimate survivor, is very much her father’s daughter. The post-Famine Irish obsession with the land is transported to America, and with it a desire never to be beholden to other people. Add in her father’s furious and quick temper, which gets him killed, and huge pride, and nearly all the elements that make up Scarlett are complete. She adds a ruthless skill in fascinating malleable men to become the supreme movie heroine. When Rhett leaves her and she’s inconsolable, her father’s words echo thru her mind, and she returns triumphantly to Tara. “He’s gone Marcus, and I never told him anything at all”. Spielberg likes to joke that only James Bond could have sired Indiana Jones, and Henry Jones Jr despite his eternally fraught relationship with Senior really is a chip off the old block; hilariously evidenced in their sequential relationship with Allison Doody’s Nazi; and that’s why they don’t get along. In a convincing display of male taciturnity it takes both of them nearly losing the other for them to finally express how much they love the other, well, as much they ever will. “I refused to play catch with him. I told him I could never respect a man whose hero was a cheat”. 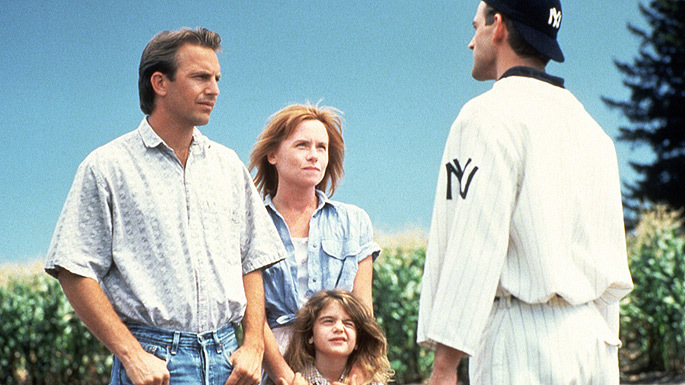 Kevin Costner’s Ray Kinsella has to bankrupt himself building a baseball field in his crops and magick the 1919 White Sox back into existence to do it, but he finally manages to atone for his sins and play catch again with his deceased father. There are few better pay-offs to shaggy-dog screenplays than when Ray realises the last player on the field is his father, as he never knew him, a young and hopeful man, before life ground him down. If you aren’t in floods of tears by their lines, ‘Is this heaven?’ ‘No, it’s Iowa’, then you’re already dead.